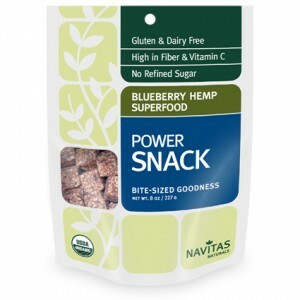 Navitas Naturals sent me some of their Blueberry Hemp Superfood Power Snack. Too bad I didn’t think to stick it in my backpack the other morning. I really could have used a boost after my Spin class. These are little cubes of energy, full of those fun ingredients that you hear about from nutrition gurus, like chia, hemp, maca, camu-camu, and maqui. It has benefits like protein, dietary fiber, omega fatty acids, antioxidants, and vitamin C.
These make a good grab-and-go snack. The are small, portable, and non-messy. Mostly, I taste blueberry and sesame seeds. There is another obvious flavor that I can’t place. If you like seeds, you should give these a try. 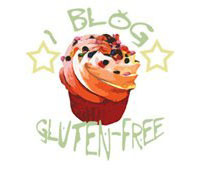 They are packed full of chia, sunflower, and sesame seeds. If you don’t like seeds, you might not like these, since seeds are such a big portion of the food. Ingredients: date paste, chia seeds, sunflower seeds, cashews, dried blueberries, sesame seeds, hemp powder, maca powder, lucuma powder, maqui powder, natural blueberry flavor, camu camu powder. I’m not sure I’ve ever tried hemp. These blueberry snacks do look tasty! I recently bought my first bag of these tasty treats. I love them! They are full of flavor and filling. They make a great gluten free snack during my afternoon energy slumps.